A new addition to the many wings of the SD Hat Guy archive is the basketball collection. There weren’t many teams that played professional basketball in San Diego: you could count them all on one hand. Among the various names is the short-lived San Diego Sails franchise which only played an extremely truncated season before folding due to the ABA-NBA merger. You may better recognize the earlier name of the team known briefly as the Sails; the San Diego Conquistadors were a popular draw and a successful franchise in San Diego from 1972-1975 after the departure of the San Diego Rockets to Houston in 1971. The team adopted the new Sails name later in 1975 with new ownership and lasted less than a month before folding. The Sails were locked out of merging into the NBA thanks to Lakers owner Jack Kent Cooke, who didn’t want to share the southern California market with another team. The Sails moniker actually predates the second professional basketball team to call San Diego home: the San Diego Clippers wouldn’t arrive until 1978. San Diego Sails caps are few and far between thanks to the relative obscurity of the team. This cap doesn’t match the exact colorway of the team but comes close; the team utilized royal blue rather than the light blue seen here. Here’s a better look at the logo detail. The multicolored red, white, and blue basketball was a staple of the American Basketball Association. Speaking of the ABA, their logo is embroidered on the wearer’s right (cap left). The ABA featured unique teams such as the Utah Stars, Miami Floridians, and the Spirits of St. Louis. Many ABA teams still exist today in NBA form: you’ll recognize the Brooklyn Nets, San Antonio Spurs, and Indiana Pacers. The rear of the cap does not have a logo. The underbrim of the cap is green to match the crown. Caps and apparel from the ABA and past NBA franchises fall under the “Hardwood Classics” moniker much the same as the Cooperstown Collection functions for MLB. 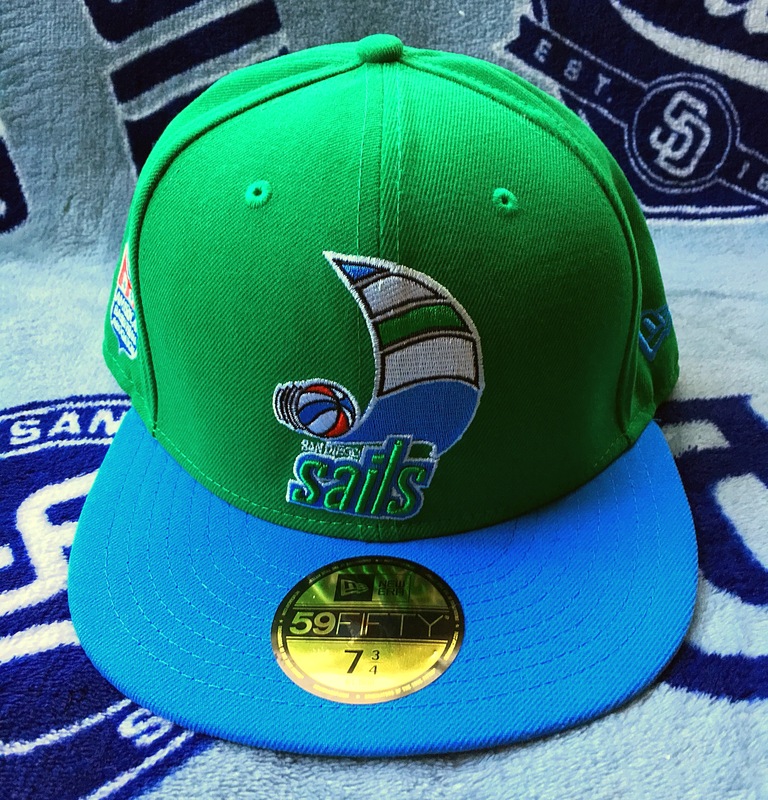 Best of luck to you finding a San Diego Sails cap. They don’t appear very often on the retail side and sometimes pop up on eBay.